Well it's no secret that there have been many changes since the store reopened. Some good, some... less than good, but they tell me they are trying their best. All I have to go on is if a product sells or not. Many of the people who left for one reason or another may never come back. One thing is certain many of them, like some of you, were fans of the never was sets. I know this because sales are down by 75% from previous Never Was sales. That's a great deal more than can be explained away by the economy. If you know them tell them I miss their support. But you are the ones how have continued to support the series and I want to thank all of you for that. But it is not financially possible to continue when so few people remain loyal buyers. I am still making sets, folklore and super hero bases but I am going to retire the never was until such time as the market can support my efforts. So now we get to see who can organise a p...arty in a brewery? Nice work. I will have to pick these up. Two New sets and the whole rest on sale now 40% off. Join the Never Was now. Cool Beans. I wanted to do a Hobit or Golem render in the mine but I ran out of time. 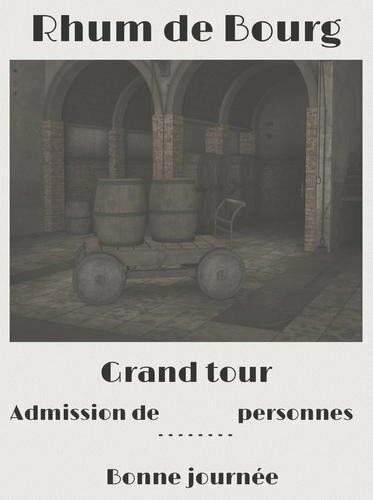 The NeverStill came very handy, was finishing an adventure yesterday to test play tomorrow, and I had already done a map for a rum distillery located in an old prison basement on a French west indie island, where the characters would take a guided tour. This is what I quickly tossed together as a handout to add additional atmosphere to the game. Coll I'm glad that work. I did a test where I hid the back wall and duplicated the base creating a really big distillery. I hate to have anyone miss out. Long live the Never Was. Well it’s no secret that there have been many changes since the store reopened. Some good, some… less than good, but they tell me they are trying their best. All I have to go on is if a product sells or not. Many of the people who left for one reason or another may never come back. One thing is certain many of them, like some of you, were fans of the never was sets. I know this because sales are down by 75% from previous Never Was sales. That’s a great deal more than can be explained away by the economy. If you know them tell them I miss their support. But you are the ones how have continued to support the series and I want to thank all of you for that. But it is not financially possible to continue when so few people remain loyal buyers. I am still making sets, folklore and super hero bases but I am going to retire the never was until such time as the market can support my efforts. Sorry to hear about the drop in sales, I love every Never piece and was always waiting for the next one. I hope things turn around; in the meantime, I'm standing in line for your Hero Stands. Thanks for all the Never we did get. I'll skip over many things and stay on a narrow point. One of the most depressing posts. The Never series was so unique! Totally our loss, again, in the end. But good luck to you Ant Farm! I'm really surprised that your Never sales are down so very much. However, it could also be more than missing customers. DAZ has had entirely too many DO sales over the last few months which has to have affected PA sales. I absolutely love the Never series, and purchased both NeverStill and NeverMine. But, I'm not as keen on other AntFarm products. I think they are ingenious, but it's harder for me to see how I would use them. Whilst my bank balance is silently cheering in the background at this news, I am quietly cursing. Sad news, but you have to make a living. Good luck with the rest of your modelling ventures! Well this is disappointing news. I love the NeverWas series. It's been my personal favorite and I would always get excited when you put out a new set. They are so imaginative and nicely crafted. An excellent value. I'm so sad to hear that your sales have been less than stellar on the last batch. Very sad indeed. Never Say Never from Antfarm. Hey, Hope Springs Eternal, or Floats, or whatever. Really sorry to hear this. I bought every single Never piece in the last sale. I personally have spent almost $3000 in the last two months, but got over 1500 items for that price (mostly DOs). At the end of my spending spree, though - my savings are decimated. odd ball folklore for us odd ball Antfarm fans? I don't know for sure, of course, but it feels like you may be bringing new folks in with the folklore stuff. Hope so. I love all the stuff put out by DAZ but sometimes really want creatures based on old folklore and their descriptions rather than on movies and gaming. I think the drop in sales are due to a number of changes in Daz policies and the marketplace itself that made shopping here, less than attractive. One of the worst changes i think Daz made was with the change of Platinum Club making the former voucher, a coupon AND not usable on PA products. Personally, I believe aside from new users, most customers budget were geared towards PA products. I think this was a HUGE mistake. There are some other "enhancements" to the marketplace that I believe has also turned customers away from shopping here. Such as the elimination of the wishlist notices, the lack of no warning when purchasing previously purchased products, the buggy Checkout process, etc. I think all of thee play a role in the decline of shopping here. Its just not the marketplace it use to be in my opinion. Another one of my favorite PA's has expressed possibly moving his store to another brokerage, or their own site for what I would believe are the exact same reasons, a decline in sales, and i think other PA's will start to feel the pinch as well... whether they actually speak on it or not. One of the worst changes i think Daz made was with the change of Platinum Club making the former voucher, a coupon AND not usable on PA products. Personally, I believe aside from new users, most customers budget were geared towards PA products. Yes! That's cut my spending here big time. I'd say at least 90% of my Daz budget was spent on PA items before the voucher/coupon change. the official posting on the coupon says "at this time Published Artist Products and certain “Resell” items are also excluded." Agreed, my spending here has plummeted and I doubt it will return. But I will still send in a support ticket or ten to get items I really want, like Never. Though if people are quitting the business altogether? I don't know the answer any more.